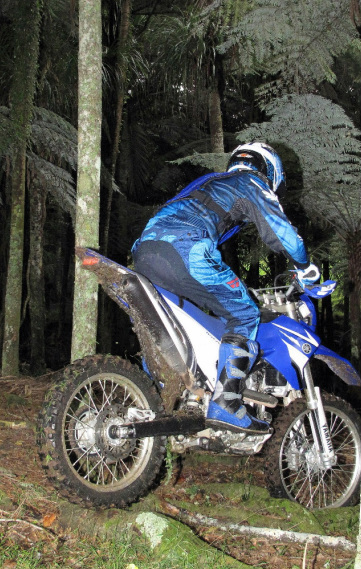 Fallen branches, sticks and tree roots are an inevitable part of riding in New Zealand. If the sticks are angled and slippery they can be devils to cross. Who hasn’t been sprawled tasting bark when we should have been straight across and away up the track. As with most common trail obstacles there are skills to apply to roots and sticks. 1. A knobbly tyre will tend to slip out on a wet stick or tree root, unless you can cross it at ninety degrees. 2. Traction on both wheels is hugely reduced on wet sticks and roots, any sudden application of power or brakes, turns the situation ugly. Wheel spin especially, is to be avoided. 3. 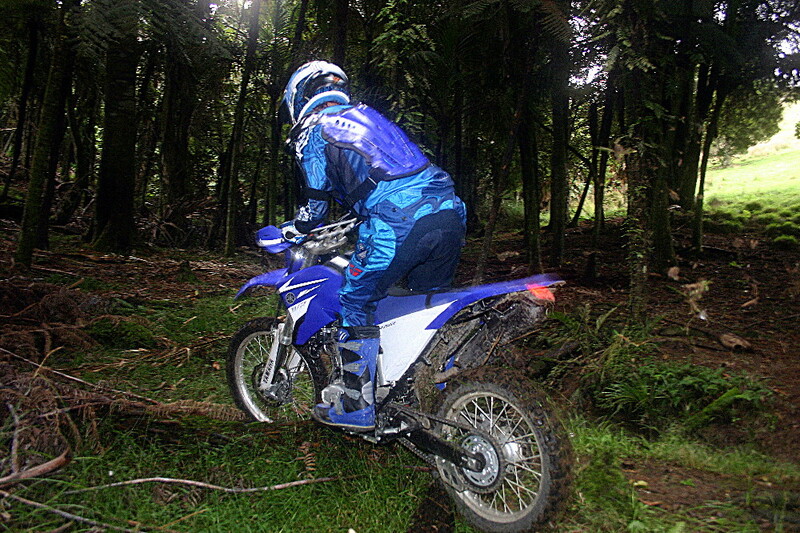 Riding into a pile of sticks sitting on the seat reduces your chances of staying upright, especially when the sticks or roots are angled or wet. If a single tree root is tackled square on it usually poses no great difficulty, but add angle, or multiple angles or bark-skinned wood and the difficulty ramps up. This is another case in which the rider must be active and use body weight to advantage. Slamming into angled sticks and tree roots only makes them harder to conquer, so the secret is to learn to cross a stick or root without only light contact, or without actually touching it at all with either wheel. Yes it can be done, with the combination of a small wheelie and a trials rider’s secret, the bunny hop. Here’s how. Get up on the pegs, with knees slightly bent and weight centered on the bike. Approach slowly in first or second gear, with the bike upright. Keep engine revs low, slipping the clutch slightly and if necessary, applying the rear brake gently to control your speed. First you need to loft the front wheel just over the stick. This requires rear weight transfer, with clutch delicately applied to lift the wheel over the root. Keep the revs steady and use the clutch, as much as throttle, for control. Note this is not a full-blooded wheelie, just enough to loft the front tyre over the root. That’s the front over, so time to lift the rear wheel. Folding and then extending your legs quickly will compress the rear suspension just before the tyre contacts the stick. Immediately, gripping the lower frame tightly with your boots, pull your legs upwards with all the speed and power you can muster. The resultant lift you achieve, plus the stored energy of the extending shock spring, will lift the rear of the bike and as the suspension reaches extension, the rear tyre will float clear over the root. Multiple angled sticks and roots are trickier, so when swinging from one angled root to another you can use another trials riders trick, weighting the outside footpeg and bracing your bum and thighs to the outside as the rear tyre contacts - that’s to the side you expect your bike to slide towards. In the root garden the front and rear wheels will be contacting different obstacles at the same time. The trick here is to avoid all wheelspin, identify a line, make a plan and smoothly carry it out. If all looks too horrible, try breaking the mess into sub sections, stopping briefly to access and conquer each individually. Crossing angled roots and sticks requires practice to develop the skills and precise timing. The best way to learn this is by repetition, in your own driveway, or on the back lawn. Start slowly with small timber to work out the timing, progressing to larger sizes as you get better. As you gain confidence try speeding the process up. Click through the slide show below for the full practise sequence.